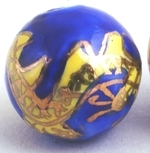 Sorry, we are currently sold out of 'Intricate Royal Blue & Gold Cloisonne Tube Beads'. Please check back later. Heavy Little Fluorescent Green Cloisonne Butterfly Pendant - Unusual!